There was something about the tarot and astrology that interested me from an early age, and yet also something that didn’t quite sit right. I knew the alignment of the planets had no literal effect on the daily lives of individuals, and I knew the future could no be told outright by a pack of cards. But I also knew that they held hidden knowledge for me: some way of coming to an understanding about myself. On a visit to York, I bought my first deck of tarot cards: the medieval deck. 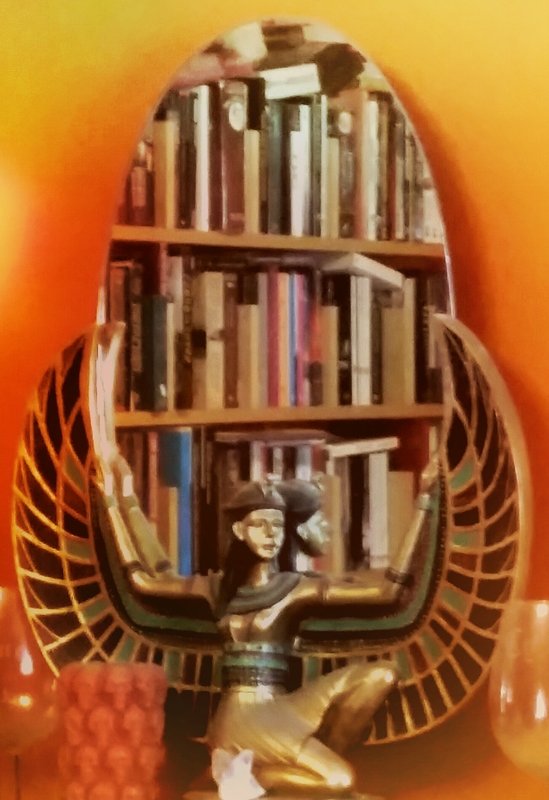 I bought a little lockable wooden box to keep them in, and I bought The Book of Thoth. The Book of Thoth is not about the medieval deck, but I bought it anyway because I liked anything to do with ancient Egypt, and on thumbing through I could see it went into the kind of symbolic depth I was really after. I started to read it in the car on my way home, and was stunned by it. Firstly, it made me see that the tarot was a way to free up a stuck mind: in response to my questioning, the cards could force me to think about a problem in a new way. They could make me see connections where I thought there were none, and they could act as a vehicle for my own unconscious mind to give me advice. Secondly, it was an introduction to the Kabbalah which I have studied extensively since. And thirdly, it was an introduction to the philosophy of Aleister Crowley and the system of mysticism he inspired which has been another long term fascination for me. In my early twenties, Prometheus Rising made something click in my mind that has stuck with me ever since. It made me understand that our brains are like software, programmed by imprints made at important points of development in life. Wilson explains with skill and humour the levels of brain functioning in us all, and the way most of us get stuck in one mode of thinking never to develop further. Perhaps the most important message in the book though, is that our software can be reprogrammed, and we can do it ourselves. We can take control of our situation by recognising what is social conditioning, what is instinct and what is intuition, and teaching ourselves to think in ways that are more beneficial to us. Another big take away from Prometheus Rising is the phenomenon of confirmation bias and the way it appears to be caught up with the universe and synchronicity. Wilson’s simple explanation of ‘what the thinker thinks the prover proves’ has impacted on the way I have seen the world since, along with ‘whatever we teach ourselves to believe becomes true in our version of reality’. To live by these two statements is to learn to believe with conviction in whatever we consider to be beneficial for us to believe in at the time, and yet underlying it is always this idea that no belief is permanent. This instils a readiness for change and a healthy acceptance of events as they come and go. Wilson has written many other books that have impacted upon my worldview, including his SFF trilogies ‘Illuminatus!’ And ‘Schrodingers Cat’. A friend introduced me to the writings of Carlos Castaneda about 12 years ago, and this is the first book I read. It is never clear whether the books are fact, fiction or somewhere in between, but they are presented as personal memoir. According to the books, Castaneda spent years of his life in an apprenticeship with a Yacqui Indian shaman called Don Juan Matus. When I first read this it seemed so fantastical, so unbelievable. But the more I read, and the more I learned about the possibilities of the human mind from elsewhere, the more I began to see just how much of his account was actually possible. There are recurring themes across the books: lessons that come round again and again, each time adding more clarity and perspective. I write about this phenomenon in my book review here. From Castaneda’s books I have learned a great many things about the role of death, the games we play as social creatures, the depth of the unconscious mind, and the power of belief. Altered states of consciousness are also described very well, and the methods by which we can hone our intuition. All of this comes in the form of beautiful storytelling, which makes the books a joy to read. It goes without saying there are many other books I could have included here: The Kybalion, The Tibetan Book of the Dead, something by Alan Watts, Israel Regardie, or Peter Carroll: these would all feature in the longer list for sure. But I can’t help but feel the top 5 that I have chosen will always form the basis for my understanding of everything else. What non fiction books would be on your list? Interesting selection. My first Crowley book was “777 and other Cabalistic Writings”. I was about fifteen and didn’t understand much of it, but it piqued my interest enough to slowly accumulate most of his other books, and a few by Regardie as well. As I got older I drifted away from these and started studying Jungian psychology/philosophy, which it turns out is not so distant from Thelema in some ways. Great idea for your post, it was fun to learn more about you. I’m pleased you enjoyed it. 777 is a really useful book but, as you say, it’s not easy to understand if you haven’t read any of his others or do not already have some grounding in kabbalah. I think Jung and Crowley compliment one another well, especially since I mainly think of Thelema as a psychological system. I find it interesting that they were both around at the same time sharing their thoughts with the world but never seemed to pay one another much attention. I’m certain they were aware of one another’s existence. It would have been tantamount to professional suicide for Jung to have associated with Crowley in any meaningful way. You’re right about viewing Thelema as mainly a form of psychological philosophy. It took me many years to mature enough to realise the true value and potential of it. If we didn’t live on 2 different continents and if I wasn’t 20 years your senior, I would be wondering if perhaps we weren’t twins separated at birth. Your influences and the trajectory of your thought process mirrors mine so incredibly closely. For me, I also got to my more spiritual place by way of existentialism which sounds odd, but it really isn’t. The Illuminatus Trilogy is still firmly in my top 5 works of fiction. As far as other books of significance to me that you didn’t mention, I would have to include The Bhagavad Gita, The Self-Aware Universe and Autobiography of A Yogi. There’s a couple more to add to my ever-growing list then! I’ve never tackled The Bhagavad Gita though it’s one I’ve always fancied. It’s referenced in a fair amount of books I have read. Shamelessly, I will recommend “BHAGAVAD-GITA IN FOCUS ” not just because I wrote it. It’s a compilation of 30 different translations and gets to the heart of the book. Please enjoy. What ever happened to Paul? Paul desert curmudgeon? He unfortunately gave up blogging sometime last year. I’m still in touch with him via email, and he beta read Mind in the Gap for me. I do miss his wordpress insights though, and have told him so, but I don’t think he’s coming back. It’s good to know he’s doing well. Let him know I was asking for him. Jung’s writings have also affected me profoundly, for over twenty years now. In reading your work, I have often felt the influence of Jung. Reading him helped me so much to discover my imagination and my intuition. I’m glad you picked up on that in my writing ☺ there’s always something else to discover with Jung. I’ve always been slightly intimidated by Nietzsche and Crowley; respectively because of the imagined intellectual sandpaper of the former and the reputation that surrounds the latter. But then, I thought Dostoyevsky was going to be sterile and the Texas Chain Saw Massacre would be a bloodbath, and I was wrong on both counts. Perhaps it is time to remedy these misconceptions. Thus Spoke Zarathustra is a good place to start with Nietzsche, I’d say. It’s philosophy but told as a series of fables, mimicking a religious doctrine which makes it quite straight forward to read. With Crowley, I think you’ll quickly find that his writings have little to do with the way he has been portrayed. He has air of arrogance at times, as many thinkers do, but he was a highly intelligent man with a lot of wisdom to impart. I just added that Nietzsche book to my list the other day, and I added Prometheus Rising based on your post. I have one of Jung’s works on my TBR list as well. Crowley’s 777 book has been on my TBR list for as long as I can remember. Jungian and Gestalt are my two favorite types of psychology. My number one influence non-fiction book is Joseph Campbell’s “The Hero With a Thousand Faces,” which speaks of his famous Monomyth/Hero’s Journey, and the threads that run though all stories. I have to admit I’m one of those people who picks up patterns where they’re potentially is none, but I’m pretty decent are showing the evidence for why I think they exist. The Campbell book is a staple of my non-fiction reference library, and I’d recommend it to anyone who wants to know or be better able to fathom how stories work and fit together. I’d also include Dion Fortune’s “The Mystical Qabalah,” which is the premiere volume on Western Qabalism, and also one of the easiest to follow. I do want to read a good translation of the Sepher Yetzirah though in addition to Crowley’s work mentioned above to get other points of view. I believe Fortune and Crowley were a bit at odds with each other, and I’d like to see other perspectives, though The MQ was a seminal and phenomenal work that I use for reference as much as Campbell’s Hero. I used to read tarot much more than I do now, but I still refer to it quite often in essays, analyses, and other examinations. Thanks for the wonderful recommendations! I’m off to see the Wizard…uh…going to the Library to play catch up…it’s fitting that Curmudgeon led me here…so he’s 20 years your senior huh? Don’t worry. In 100 years you’ll both be the same age.